It’s been a while, but I am back now. There has not been too much going on at council worth commenting on except for this question. Should Ann Arbor try to control the deer population? I think some residents and the city council are going a little bit overboard with the broad characterizations of Ann Arbor’s deer problem. This is not an Ann Arbor problem, it is a statewide problem and at minimal, a county wide problem. Will anything we do actually help the situation? I think not. It is all for show and simply pandering to a constituency. Early last year some residents complained to city council that the deer population was getting out of control and they wanted the city to do something about it. Some complained about their gardens being destroyed by deer, others pointed to the dangers of Lyme disease, and others pointed to the increase of car accidents caused by deer. The council directed the City Administrator to look into the issue and to report back to them. The city has set up a Deer Management Project web page where you can access all relevant information. During the spring of 2014, City Council directed Ann Arbor’s City Administrator Steve Powers to report on the status of a partnership with the Washtenaw County Parks and Recreation Department, the University of Michigan, the Humane Society of Huron Valley and other interested parties to develop deer management information with the assistance of the Michigan Department of Natural Resources Wildlife Division. The directive from Council arose as a result of resident reports of deer damaging landscaping and concerns regarding vehicle/deer collisions and deer-borne diseases. On Aug. 14, 2014, the City Administrator provided to City Council the requested report. The Deer Management Options Report outlined the need to develop a community-endorsed deer management plan built upon community input and management options approved by the Michigan Department of Natural Resources Wildlife Division. The first deer management public meeting discussion was held on Wednesday, Dec. 10 at Huron High School. View the meeting agenda.pdf or public presentation.pdf. This meeting was taped for cablecast on Community Television Network and is available to view online via video on demand. A second public meeting will be scheduled in late January or early February 2015. The most useful part of the page is on the bottom in the supporting documents section. There you will find the City Council Deer Management Report from the City Administrator. Tale a look at it, specifically the appendixes at the end. Now lets go through all the main arguments people have been using to justify their reasoning to be pro-cull of deer. Deer in Nichols Arboretum. I swear she stopped and posed for me. Of all the arguments out there, this is the most selfish and unreasonable arguments. However, I do realize that to those of you who have your gardens devoured, you don’t think so. If you buy a house on the edge of a park or nature area, you can’t complain about nature coming into your yard. Move. Those of you who live around the Arb and use it as your backyard, do not get to complain to the city that nature is invading your space. Move. If Ann Arborites want major parks and nature areas within walking distance from their homes, then guess what, nature can easily walk up to your home also. Don’t like it, move! Nature is not just plants and pretty things to look at from a distance. Nature is not just paved paths surrounded by trees for pedestrians and bicyclist to use. (think border to border trail). Nature: the phenomena of the physical world collectively, including plants, animals, the landscape, and other features and products of the earth, as opposed to humans or human creations. There are specific plants that deer like. If you plant “deer candy” in your yard, the deer will come out of the Arb/park/nature area to eat the yummy plants versus eating the bland plants in the woods. Wouldn’t you? If your choices were eating oatmeal everyday in your house versus a short walk into a neighborhood for pizza or candy wouldn’t you go too? I know you think you have the right to plant anything you want, but that right does not mean we have to kill the deer so that you can look at some tulips or hostas in your garden. All squirrels are collectively know as “Wilbur” to me. They all share the one name when I yell at them. My niece named them once upon a time. I live on the south side of Ann Arbor and have little problems with deer. My nemesis is Wilbur, the squirrel. Wilbur has done too much damage to my flower beds for me to ever really like him. And he truly has no learning curve. He hates daffodil bulbs, yet everyday in the spring, I come home from work and he has dug up at least one bulb, had taken a bite, and then left it on top of the ground too die. I re-plant it, but then the next day he does it again. Grrr…you would think by now he would learn that he does not like the bulbs and that he should put it back in the ground. He digs up everything! Between him and the bunny that keeps trying to use my vegetable garden as a nest for her babies, it drives me crazy. But then I look out on the front lawn and see 10 squirrels chasing each other while playing and looking oh so cute or the bunny hopping across the lawn in the early morning and I mellow out. So I get it. I know what it is like to have varmints destroying your garden. I try and be reasonable, but sometimes the Elmer Fudd does come out in me. I don’t reach for a gun or sling shot to chase him away. I simply use an old fashion weapon, the garden hose. You might think that a deer does more damage to your garden than a squirrel, but I think not. Try dozens of squirrels and bunnies. We all have problems with nature. Animals eating plants is nature and should not be reason enough to cull the herd. This argument is not even relevant yet. There are no cases of Lyme disease in the east side of the state that have been contracted here. Yes, some people have been diagnosed with Lyme disease here in SE Michigan, but these cases have been thought to have been contracted in other areas. This could be an issue in the future, but is not yet, so it is not relevant for today’s debate. After all keeping chickens as pets or close to people’s actual homes can help start and spread bird flu, but we didn’t consider that when “enthusiastically” allowing people to keep chickens in cities. Same thing, different future problem. Sidenote: FYI, bird flu starts when a virus that can only infect chickens mutates and then infects a human. Since humans have never seen this virus they get really sick. If the person becomes contagious, then the bird flu is passed on to other people. This does not always happen. Sometimes the initial infection is the only infection. Those who live on farms do not live that closely with chickens, but those that keep them as pets and in close quarters with them in cities run the risk of picking up a virus. This is why Asia always appears to be the center of bird flu outbreaks because of their culture where they live closely with chickens. (link) Chickens as pets or close to your home are not a good ides. First off, I have to point out that for every controversial issue here in Ann Arbor, there will be an opposition group that gets organized and tries to convince everyone that they are a real legitimate scientific group or non-profit. A group of residents have formed a group called the Washtenaw Citizens for Ecological Balance. Lets be clear, this a group formed by residents simply in response to the deer issue in order to make you think that what they say is scientifically sound. There website is impressive and very professional looking for such a neighborhood opposition group to have created. Although some of what they claim may be true, it is most likely all bias and spin, so take what you may read there with a grain of salt. Now, their argument is spun much better than simply saying that I don’t want the deer eating my garden plants. They claim that the deer are interfering with nature. They want ecological balance. Huh? An ecosystem is a community of living and non-living things that work together. Plants are pollinated and grow; animals eat plants or other animals, microbes decompose the leftovers. Our ecosystem balance in Washtenaw County is askew, in part through our killing off of large predators. This lack of predators has led to an overpopulation of a certain species that negatively affects the rest of the ecosystem. Here, now, deer have become that destructive species; changing the composition and structure of forests by feeding on select plant species, denuding the forest of its shrubs and saplings, jeopardizing future regeneration. Birds that nest in shrubs or in the intermediate layers of the forest, have declined. The native white trilliums that once dominated the forest floor have all but disappeared. The forest floor is presently dominated by garlic mustard, an invasive exotic that the deer avoid eating. Folks, nature ebbs and flows. We can’t control much of it. We can only stop humans from hunting animals to extinction (especially those that are predators of other animals that may reproduce too much, such as deer) or stop pollution from invading nature areas. Trying to keep everything in balance so that everything gets along with each other in parks and nature areas is just asking for trouble. There is a lot of talk out there regarding how the animals are eating too many plants in the woods and parks, eventhough City parks have not reported any evidence of real damage. Animals shouldn’t eat plants? Huh? Now, think about that statement about the deer eating and destroying plants and trees. What is the metric to use to determine this? How many plants are deer allowed to eat? How much is too much? How do we know which species is the cause of the damage? Shouldn’t deer be allowed to eat more since they are bigger than squirrels and others? Are deer worth less to us than the possums, squirrels, rabbits, birds and other creatures in the parks? Who gets to judge what is damage vs what is nature? What about all the damage that the Canada Geese do to the parks? Poop everywhere. I’d rather get rid of all the Canada Geese. Can’t stand them. Squirrels, rabbits, canada geese…my list is getting long. Oh and I should add skunks to my list too. Smelly little creatures. When they are around I can’t enjoy my yard. Too many of them. Hey, maybe NO animal should be allowed to eat a plant in a park or nature area…we should feed them food from a trough. That way all the plants can survive in their glory and the animals can eat processed food. It stuns me that some think that it is wrong for deer to eat plants. It is nature. If the deer eat too much of a specific plant, the correct solution is for humans to try and compensate for the loss of a plant species and plant more of what was destroyed/damaged or to protect the young growing plants. We should try and prevent more deer from being born, not punish them once they are living. We shouldn’t kill a living thing for doing what is natural to them. Hunting deer for food is a completely different thing though. I am only talking about killing deer because they are damage plants. Deer have become the black sheep of our parks now. Now don’t get me wrong, there is some truth to what this group claims. This group’s message could work on the state or county level just not on a local level. No one wants deer to take over every nature area throughout the state and decimate the statewide ecosystem. It just sounds silly saying that it is is happening in our parks when we have much less deer than many other parts of the state. I don’t buy it. If you truly wanted ecological balance you would be pushing to bring back the natural predators (wolves), but the wolves might eat your garden plants too! This group is throwing everything at the wall to see what sticks. They even blame the garlic mustard problem on the deer. (see excerpt form their website above). The deer have not eliminated the trillium which causes the garlic Mustard to spread. What is more likely is that the garlic mustard has crowded out the Trillium and the deer then have to go into the neighborhoods to find food. But I see Trillium in the arb every spring so I don’t know where they get that accusation. The only argument that I find plausible to justify a deer cull is the one dealing with vehicle/deer accidents. If…and I say if….there was an increase in vehicle deer collisions over time and they were still increasing, I would be all for a deer cull. But the numbers don’t increase. In fact, in Washtenaw county the Deer-Vehicle (DV) accident numbers appear to decrease over the years. There is also a decrease in all neighboring counties. Source: Fritz Klug, Database: See where in Michigan car-deer crashes, fatalities happen most. October 23, 2013. Data was provided by the Michigan State Police for the database in this story. The 2013 numbers only include Jan-Oct 2013. 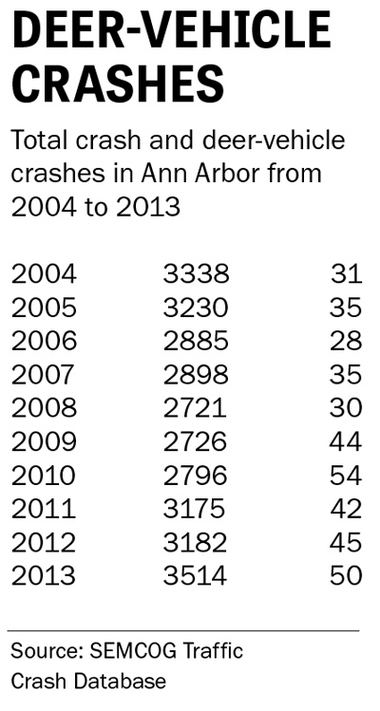 Nonetheless in the City of Ann Arbor, there appears to be a small increase if you look only at the number of crashes. Loving data, I decided to actually run the numbers and see what they look like. Here are the percent of deer-vehicle (DV) crashes when adjusted for total vehicle crashes for Washtenaw County and the City of Ann Arbor. Data was compiled using the Michigan Traffic Crash Facts Database as well as using the data from the above charts. First thing I noticed was that Washtenaw county, as a whole, has a much larger percentage of crashes related to DV accidents. I guess it’s not surprising considering most of the county is rural. The thing to note is that not only have DV crashes gone down over the past 6 years, but also the percentage of DV crashes compared to all vehicle crashes has decreased over time. The City of Ann Arbor on the other hand appears to have an increase in DV accidents at first glance, but when the numbers are adjusted as a percentage of all vehicle crashes the numbers remain about the same in the 1-2% range for the past 6 years. However the percentage of deer-vehicle accidents don’t CONSISTENTLY increase over time. The percentage goes up one year and down the next. You would expect the rise in accidents to climb along with the increase in deer population if they were correlated. While it is true that from 2004 to 2007 the percentage of deer-vehicle accidents fluctuated from 1%-1.2% (data not shown) which is a lower percentage than years 2009-2013, the small increase of an average of 0.3% over the years is negligible and quite possible due to randomness. I say this based on the fact that the numbers don’t increase on a consistent basis 0ver time and fluctuate back and forth. So it does not appear to me that there is any sort of increase DV crashes over the past decade that can be correlated with an increase in deer population. Some residents might be seeing deer more frequently, but the deer have not caused an increase in more DV crashes. So why is it that people are noticing the deer more than they used to? Could it be that the deer are just more socialized to humans? Like I said in the caption of the second photograph, I swear the deer posed for me. They are comfortable with us and are now venturing out to eat better tasting food because …they simply can…would be my guess. Is there an increase in deer population locally? I don’t know, but there is NOT an increase in DV crashes or in visible plant destruction in the parks and nature centers where the deer mostly hang out. I see no justified reason in my mind to have a deer cull in the City of Ann Arbor. I would be in favor of some type of sterilization method if the FDA allowed it. With that said though, we do know that there is an increase in deer population throughout the state. Will this increase in population eventually effect us in a more prominent way? I don’t know, but what I do know is that I think it is way too soon for the city to take this action. It seems to me that a deer cull is a useless effort on the local level. It is a lot of money for little result and little gain. Deer live throughout the entire state of Michigan, not just in the Ann Arbor area. If we decide to cull the herd and take out 2 deer or even 20 deer, I don’t believe we would ever see an impact. Deer from other crowded areas will just move in. Maybe our increase in deer population is a direct result from the recent deer culls in Barton hills and Jackson County? Deer move on when threatened. Maybe all the deer hunting throughout the state has taught the deer to find more safe areas to live such as our parks and nature areas near the cities and suburbs. $25,000 is a lot of money to spend on something that has questionable results. I don’t believe that we can solve this locally and our time is better spent with working with the county or state on a larger more realistic plan. All the reasons presented publicly so far have not convinced me to support the deer cull. I am not an extreme animal lover in any way. I don’t own pets. I support animal medical research. I eat meat (not a vegetarian, love beef). I am ok with hunting as long as the hunter eats what the hunt or gives it to others to eat. I am just not for this. It just seems to soon and too extreme. I like going to the parks and seeing the deer. All the deer pictures in this article are mine taken in the Arb. I would hate to have the deer scared and afraid in their own home. I know this sounds silly, but I would prefer to have the deer culled who are out wondering the city, not the ones who are living peacefully in the parks. I hope council comes to its senses and sees this for what it really is. A group of residents don’t want the deer devouring their gardens. Plain and simple. Is that worth $25K/yr or more of tax payers money to prevent that? If so, I want the city to invest in birth control for squirrels. Only half kidding. Just saying. Ryan Stanton, Ann Arbor deer population topic of Dec. 10 public meeting at Huron High. Mlive.com. December 4, 2014. Ryan Stanton, Emotions high as Ann Arbor considers options for controlling urban deer population. Mlive.com. September 7, 2014. Ryan Stanton, Ann Arbor residents express strong opinions for and against hunting deer in city. Mlive.com. Decmber 27, 2014. Ryan Stanton, DNR: Deer options in Ann Arbor could include everything from repellents to killing. Mlive.com. November 28, 2014.